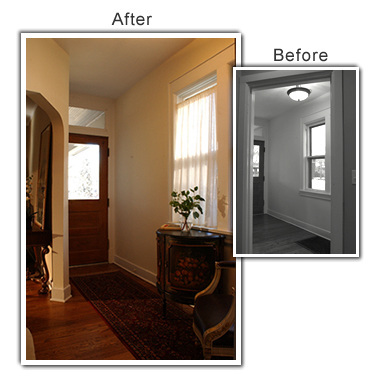 Foyers and entryways are your chance to make a good first impression on buyers. Below, a runner adds a rich base of warmth to a stark, small entryway. A shear is hung over the window using a tension rod to avoid unwanted nail holes around the window frame. The painted chest and chair represent an invitation to stay and linger. Fresh flowers add a touch of life.